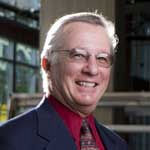 George Hawkins is retired after 35 years as a construction industry association manager. He was broadcast reporter and news anchor in Denver. As a Navy officer, he saw action in Vietnam in the River Assault Squadrons and is the recipient of a Silver Star and Purple Heart.